A jackhammer (also known as a demolition hammer or pneumatic drill) is a pneumatic, hydraulic or electro-mechanical tool that marries a hammer with a chisel (Source). The way they work, an internal hammer is driven up and down, repeatedly striking a hard surface to break it up (Source). We took a look at 5 electric jackhammers- these are primarily designed for home, as opposed to commercial, use and are great if you're looking to save money buying rather than renting a functional demolition tool. An electropneumatic hammer (often referred to as a rotary hammer) employs an electric motor. It works with a crank system- this electric-powered crank moves a hammer with two pistons (the drive and free flight piston) with the flight piston propelled against a striker that is in contact with the the drill bit (Source). The three different types of jackhammers include the pneumatic that works by air compression power, the hydraulic that works from fluid-based hydraulic energy and the third, which we have examined in this post, the electric jackhammer (Source). The 35 lb. XtremePowerUS Jackhammer comes in either 2,200 or 2,800 watt options, both providing 1,900 Impacts Per Minute (55j). It ships with a carrying case, a 1-1/8" flat chisel and a 1-1/8" bull point chisel. XtremePowerUS recommends Shell Rotella oil- which is 40w diesel engine oil to keep it running smooth. Reviewers we spoke with endorse it for trenching, demolition, chipping, breaking up block, tile stucco, concrete, brick, and the removal of entrenched foundations, concrete slabs, and oil chimneys. Reviewers have told us that it's not powerful enough to breakup natural rock, however. Buyers tell us that you should keep in mind that this 35 pound jackhammer will not provide you the same demolition capabilities of something that weighs 90 pounds with a larger chisel tip. If you are doing more than a couple hundred square feet of concrete breaking, it will take you a long time, so plan accordingly. Let's examine the 5 best-selling options on the market and see how they compare. This heavy-duty electric jackhammer offered by XtremepowerUS is well-made, powerful and suitable for demolition, trenching, chipping, and breaking holes. Users love the high-quality design and the price, but some do note that there is no oil included in the package. The demolition jackhammer measures 13.8” x 31.1” x 8.3”, and it features a 2200-watt motor, a weight of 35 pounds, and 1900 impacts per minute. The package also includes a 1-1/8-inch bull point chisel, a 1-1/8-inch flat chisel, a blow molded case, and gloves. It’s suitable for concrete, brick, block, tile stucco, oil chimney and more. In general, users have a high opinion regarding the XtremepowerUS jackhammer, and they praise its performance and functionality. A buyer comments that the demolition hammer is more powerful and effective than he expected and that he managed to deal with a 6-inch deep concrete wall quickly. The reviewer warns that you must use eye protection to avoid flying chips of concrete. Another satisfied user mentions that he tore down a 20’ x 20’ concrete slab in three days and that the electric jackhammer arrived quickly and well-packed. A user shares that the electric hammer is sturdy, heavy-duty and easy to use once you’ve read the instructions. However, some customers have complained that the jackhammer is not as powerful as they expected and that it broke only after a couple of uses. Some users also state that the bits are problematic and that the case arrived shattered. If you are searching for a powerful demolition jackhammer, you might take a look at this electric jackhammer offered by Neiko. Users love the extra accessories, but some do note that it leaks oil. This Neiko hammer measures 6.5” x 27.9” x 11.8”, and it features an 11.3 amp high-performance motor, a BPM of 1,800, heavy-duty construction, a corrosion-resistant coating, a helical gear system, a 360 swivel auxiliary non-slip handle and a weight of 48.5 pounds. The package also includes a blow molded case with rolling wheels, two SDS chisels (point and flat), four extra carbon brushes, one oil container, three wrenches, and a protection kit. A buyer comments that he broke a 4-inch concrete slab for less than 35 minutes and that the Neiko electric jackhammer arrived very well-packed. The reviewer states that this is the best inexpensive jackhammer available and that he highly recommends it. Another user mentions that he dug a large hole for about two hours and that the demolition hammer doesn’t have any issues with clay or soil. He adds that it’s quite heavy and you should be careful. A purchaser says that her husband has been using it for two years with no complaints or leaks. However, some customers have complained that the jackhammer stopped working very quickly and that they had problems finding suitable bits. Some also note that the case is not well-made. 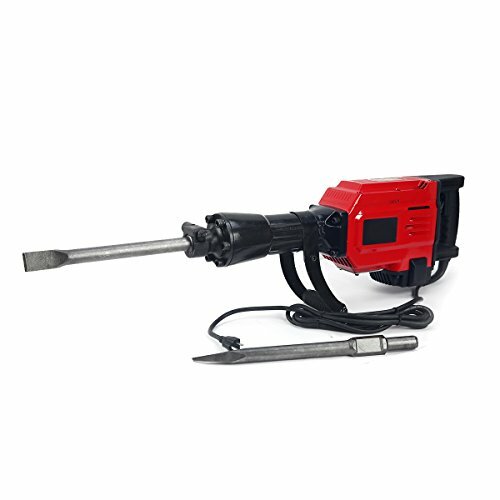 This original electric jackhammer offered by TR Industrial is well-constructed, reliable, easy to use, and suitable for concrete, clay, basement floors, and more. Users love that the hammer is powerful and effective, but some do note that it’s too heavy. The TR Industrial jackhammer measures 30” x 14” x 7”, and it features an 11-amp motor, a BPM of 1,800, a 360-degree swivel auxiliary handle, dual ball bearing armature, and a weight of 53 pounds. The package also includes one hex-pointed chisel, one flat chisel, two wrenches, an oil container, and protective goggles and gloves. A customer comments that he removed his tiles for less than three hours and that the jackhammer worked better than he expected. He also adds it’s easy to change the oil and to swap the parts. A reviewer shares that he doesn’t have any issues with the demolition hammer even if he uses it continuously for hours. Another happy buyer states that the electric jackhammer arrived in perfect condition and that it cuts through 5-inch concrete slabs quickly and efficiently. A user shares that the quality of the TR Industrial jackhammer surpasses its price immensely and that he highly recommends it as a professional. He warns that you should check the oil level before each use. However, some reviewers have complained that black blow molded case is of cheap quality and that it arrived damaged. Some users also note that the demolition hammer won’t last too much if you use it often. This demolition jack hammer offered by XtremepowerUS is well-designed, light, affordable and an excellent choice for your DIY projects. Users love the price, but some do note that that the instruction manual is hard to comprehend. 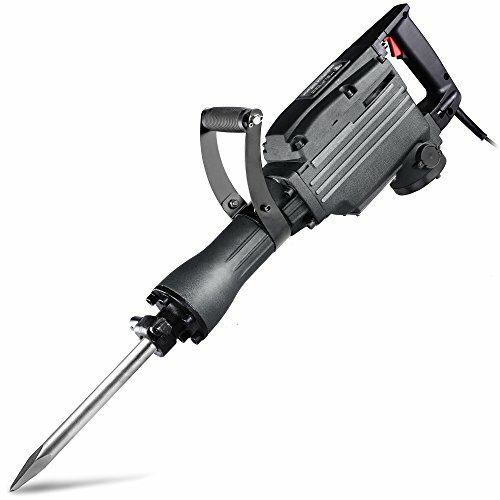 The XtremepowerUS jackhammer measures 18.3” x 13.4” x 4.7”, and it features a weight of 20 pounds, an input power of 1000 watts, a BPM of 3000, and a maximum drill capacity diameter of 1-1/2 inches. The package also includes one 5/8” hex shank point chisel, one 5/8” hex shank flat chisel, and a storage case. A buyer comments that he used the jackhammer to demolish hardwood floors and that he was very surprised by its performance. He highly recommends it to anyone looking for a cheap jackhammer. Another customer mentions that he has been using the electric jackhammer to dig holes in a hard soil and after a couple of weeks, he has no performance issues. However, the user states that it’s difficult to find bits that would fit the hammer. Another reviewer says that the demolition jackhammer is perfect for removing tile floors and that it does the job quickly and efficiently. However, some customers have complained that the support handle broke and that they had problems contacting the seller. Some buyers also note that the hammer gets hot after 30 minutes of use and that it malfunctioned only after a couple of weeks. If you need a reliable tool for demolition or chipping, you might consider this electric jackhammer offered by Goplus. Users love the solid metal body, but some do note that it’s harder to use than they anticipated. The Goplus demolition hammer features a 2200-watt motor, a voltage of 110, an RPM of 1900, a weight of 33 pounds (without the cord), and a 360-degree swivel handle. The package also includes a heavy-duty carrying case with wheels and a handle for easy transport, one bull point chisel, one flat chisel, one oil bottle, two carbon brushes, three hex wrenches, protective gloves, and a manual. A purchaser shares that he has used the Goplus jackhammer five times and that he doesn’t have any complaints regarding its functionality. He adds that the jackhammer is perfect for chipping rocks and that he would gladly buy another one. A happy user mentions that he used the electric jackhammer to dig holes through solid rocks and that even though he used it continuously, it didn’t show any signs of overheating. He says that the quality is very impressive and that he highly recommends it to anyone looking for the best jackhammer. Another purchaser states that this tool is a necessity for every DIY-projects and that it works perfectly. However, the users note that the jackhammer is quite heavy. A customer also has complained that the demolition jackhammer vibrates too much and that it’s very difficult to use for long hours. ​The first demolition jackhammer we took a look at was the XtremepowerUS electric concrete breaker- it comes in 2,200 W and 2,800 W power options, providing 1900 impacts per minute. Buyers who purchased it often wondered how much it weighed, and the consensus opinion is that the electric hammer on its own without having any bits installed weighs 31 pounds, the chisel bit itself weighs 3 pounds, and the bull bit weighs 3 pounds. Reviewers we spoke to told us that in general when looking for a jackhammer for sale, with this demolition power tool the more watts or amps usually means that you'll be buying a bigger motor, which means that you'll be buying a bigger hammer, rather than a small jackhammer. One reviewer purchased this to break up his driveway pavement that was 10 feet wide and 5 inches deep- he purchased a pair of cut-resistant ﻿﻿gloves to absorb the concussive shocks of its blows and was totally flabbergasted at the inexpensive price compared to more expensive Bosch Brute jackhammers. Other reviewers advise the new buyers to ensure that you oil it- if you begin using a straight out-of-the-box or you will burn it out. It's recommended to lubricated with diesel engine oil. Other reviewers were satisfied with this small demo hammer saying that as an electrical jackhammer it is an inexpensive option with a lesser-known name but with equivalent performance. As well, construction engineers who have purchased this option advise undecided buyers that this isn't the best option for breaking up and natural rock because it lacks the power to do so. Reviewers advise that besides employing an insulated pair of gloves you should also consider wearing protective eye gear because without any protection you're liable to kick up stone and debris directly into your face. 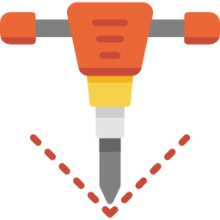 As far as its use, reviewers say that until you center the demolition chisel on a hard surface, the internal hammer will just noisily spin- the impact motion itself is created when you've placed it on something hard. Buyers told us that the ball point chisel was effective at splitting up concrete, much more than the flat chisel. Another construction professional purchased this small option for home use says that he was satisfied with the demolition jackhammer's ability to be modified with pipe adapter cups for use hammering in fence posts for an automatic gate opener, as opposed to a gas jackhammer he'd used in the past. The second electrical demolition jackhammer we took a look at was manufactured by Neiko. The manufacturer says that it provides 11.3 amps at 1,800 impact beats per minute designed to break up brick, concrete, and earth. It includes an auxiliary handle that can swivel 360° and is fitted with a grip engineered for comfort and a non-slipping hold. One reviewer we spoke to endorsed it has a heavy-duty, mini jackhammer that can provide power for demolition, but shouldn't be used for stripping purposes like tiling projects where it might damage the subfloor. Another reviewer who works as a construction professional with tons of industrial power tools says that this is a middle-sized option, stronger than lighter weight models, but not as unwieldy as larger and more powerful demolition hammers. 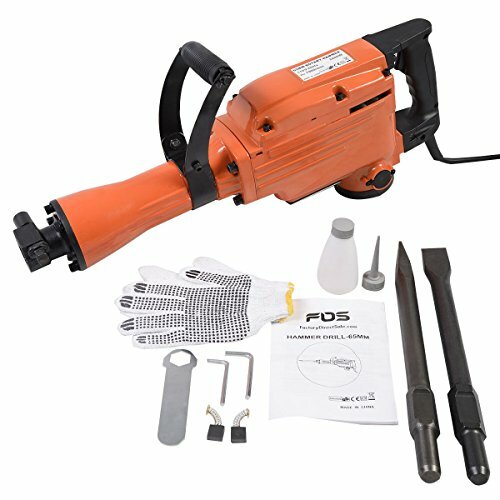 Because it is lighter weight, if you are jack-hammering a really large chunk of concrete it can be challenging to get the leverage to pull it out of the ground- with many buyers employing a breaker bar or extendable ratchet in those circumstances to avoid busting up their hands and knuckles. Reviewers were also pleasantly surprised that this mini jackhammer doesn't painfully vibrate their hands during the course of extended use. Another reviewer told us that overall he satisfied-though in comparison to traditional jackhammer that cost up to 10 times as much, it doesn't quite have the same power but could be useful for your purposes depending on what you're looking to demolish. Other reviewers write that depending on how long the job is you're undertaking, it can make sense to purchase an electric jackhammer and just own it instead of renting one over the course of several days, oftentimes for $100/day. If you are working in hot weather with one of these industrial power tools some reviewers advise that you give it a break every several hours to avoid it overheating. As well, some buyers said that it is prone to leaking oil, which didn't disrupt the efficacy of the jackhammer demolition, but it's something you need to keep an eye on so that it doesn't burn out. One buyer we interviewed, who had purchased them used before, told us that this tool is ideal for lighter duty jobs, but you will have to keep watch over its various screws disassembling and potentially causing the machine to break apart. This probably isn't the option for you if you were looking for a permanent cement hammer solution- this reviewer told us. Another home repairmen purchased a clay bit to use for demolishing coral rock- great for digging up holes for plants and working and fence posts that are embedded in coral rock. The third demolition jackhammer we looked at is manufactured by TR Industrial- it's powered by an 11 amp motor that provides 1,800 full load impact rate and ships with a flat chisel, a hex pointed chisel, a pair of wrenches, safety goggles, and impact-resistant working gloves. It is advertised as an effective and powerful way for drilling through basement floors, concrete s​urfaces, driveways in a variety of tough and hard surface areas for residential and commercial purposes. Indeed, reading about this jackhammer in the trade publication the company produces, they market it as a particularly safe option that is durable for long-term use and vetted by German and American research laboratories as far as its durability and safety go. Specifically, it underwent a 176-hour durability test- this sort of intensive product testing provides added buyer security prior to purchasing a small electric jackhammer. Overall, buyers say, that the jackhammer weighs 32 pounds with the bit weighing an additional 4 pounds. Reviewers say that, in general, this is a stable demolition tool hammer that is well assembled, worked for several hours on end without issue, and is easy to oil and replace parts on. On the downside, some buyers told us that the cord is a bit too short- you'll want to invest in a heavy-duty extension cord to supplement it and it's relatively heavy, though on average this is a relatively lightweight electric jackhammer. Another reviewer advises the new buyers to familiarize themselves with how to effectively operate one of these tools before blasting away at their project. In essence, this reviewer advised it be used on concrete that is 1 inch to 5 inches thick- any more than that and it will be a bit of a struggle to get the job done. Another plumber we spoke with says that he took the chance purchasing this option as opposed to renting a more expensive industrial-strength unit and was pleasantly surprised by its ability to demolish reinforced concrete. Another reviewer concurs saying that his local hardware supply store rented units for $100 a day, and since his project took him three days to complete, having invested in this option save him money and now he has a spare jackhammer to use whenever the need arises. Indeed, the manufacturers describe its 11 amp motor as providing 45 impact joule pumps, which provides powerful concrete impact. The fourth demolition Hammer we took a look at was manufactured by XtremepowerUS. It has an input power of 1,000 W, providing a hammer frequency of 3,000 BPM and its maximum drill capacity diameter is 1.5 inches. It ships with a hex shank point chisel and a hex flank flat chisel. One buyer we interviewed said he purchased it for concrete chipping, saying that he uses it for several hours at a time, but does observe that the heat level builds up at about the half hour mark. Another user describes undertaking a bathroom remodeling project and initially working manually with a sledgehammer and chisel before upgrading to this electric powered demolition jackhammer that got the job done much, much faster. The last electric power demolition jackhammer we looked at was the GoPlus model. It ships with a carrying case with wheels, features a 360° swiveling handle and is ideal for chipping, trenching, demolition, concrete breaking, brick distraction as well as tile stucco removal. It's powered by a 2,200 W motor, weighs about 33 pounds and is suited for business and home use. This is not a variable speed electric jackhammer, but the trigger enables you to intermittently turn it off and on, even locking the hammer action in place. One buyer purchased it for removing ceramic tiles from a newly purchased a home that he was remodeling- he used a wide a chisel tip for this purpose. One home remodeler describes having rented jackhammers throughout his life for demolition purposes, before deciding to finally invest and owning one. He does recommend that you purchase your own oil and fill it up before you begin jack-hammering- he also advises that it be warmed up a couple minutes before you start working on hard concrete. Another reviewer expresses the common thread of concern that it is pretty heavy- and they say that if you try to let the jackhammer itself to the brunt of the work that produces relatively weak results. They say that you really have to put your all into it truly engage and extract the full measure of its brutal, demolition force, with oftentimes painful vibrational results to shoulders, wrists, and hands. On the other hand, many buyers found it relatively easy to wield to chip large rocks and boulders in their gardens- performing a landscaping task do you normally wouldn't associate with a home-use jackhammer. It should come as no surprise that jackhammers are incredibly rugged but pretty temperamental instruments to use- often finding application in the demolition of concrete. Most people find them to be incredibly heavy, so in general only trained service professionals are recommended to use them. Helpfully, jackhammers employ a variety of different blades and tips you can install on the hammering end depending on the sort of job that you are doing. When it comes to using a jackhammer, you should put some forethought into whether you need a medium capacity or heavy capacity jackhammer-this will depend on the type and amount of work you plan on doing. It's a good idea to invest in hearing protection prior to use- safety goggles and gloves are off so advisable to ensure that the strong vibrations don't injure your body or the kick up from the jack-hammering demolition doesn't shoot rocks and debris into your eyes. Construction professionals recommend that you use spade tip for asphalt demolition, use a chisel point for concrete breakdowns and a rock point for breaking up natural rock. When you first receive your jackhammer, no matter whether you purchase it from Home Depot, Harbor freight, Lowes or from an online retailer like Amazon.com, do a full inspection before you begin using it- it's crucial to detect damage or defects prior to operation so that you can return it easily and you don't injure yourself from a faulty piece of equipment. While using the jackhammer, it's common practice not to hammer down below the cutting bits depth. When it comes to operating an electric-powered jackhammer, many buyers advise that you toss the electric cord onto your shoulder so that you don't end up drilling into the cord and electrocuting yourself. Especially if you are operating inside of a closed environment, dust extraction measures should be employed to eliminate as much as possible the incidence of airborne dust. You'll often see construction site personnel switch off as they use the jackhammer- this prevents fatigue and decreases the risk of operator error over the course of a day of jack-hammering.